Humans battle with obsession at every turn, the desire to be successful, to obtain a certain status and just maintaining a lifestyle can be an exhausting process for the American working class. OF UNKNOWN ORIGIN plays into those anxieties in the form of defending your home from vindictive vermin. This under-seen film gives us a tight thriller with a layered performance by the legendary Peter Weller (best known for ROBOCOP) with a stylish tone that captivates and effectively creeps the hell out of you. The story of UNKNOWN ORIGIN is simple, yet complex due to the direction of George P. Cosmatos (TOMBSTONE). The film achieves and elevates a sense of horror complied with a highly relatable form of stress that far exceeds expectations. What you can’t see can certainly be terrifying. Bart Hughes (Weller) is a New York City business man who has worked his way to middle-management and an upper-middle class lifestyle that every American “dreams” of achieving. He has a wife, Meg (Shannon Tweed), a son, Peter, who lives in this massive NYC brownstone he renovated himself. He spends his days obsessing over keeping a tidy home and a work life that is slowly taking time away from his family. When Meg leaves town, Bart has the castle to himself, but rather quickly discovers there’s a mysterious intruder lurking in the shadows. What’s plaguing Bart can be spoiled and continue to have a lasting effect, but for the purposes of this review let’s keep the mystery box closed. Just know that if you dive into this gem the surprises and fun can be boundless. Largely this film succeeds due to the collaboration of Weller, Cosmatos and screenwriter Brian Taggert, who all bring their own sensibilities to crafting a story that delivers on thrills and fears simultaneously. Weller is a master orator in nearly every role, and here he delivers legit a monologue that telegraphs fear, history and acting precision that’s awe inspiring. He shows Bart’s descent into madness with a twinge of humor mixed with an incurable mania that fills the entire screen. Cosmatos’ camera that only gives us glimpses of the intruder (we call this the JAWS effect), but shows enough to deliver fear. His greatest tool as a director is how he uses sound to add layers of fear to the frame. Taggert’s script has a charm that gives the audience room to have fun without skimping on the artistry in his words. OF UNKNOWN ORIGIN is undoubtedly a great film that’s haunting, relatable, funny and has everything you’d want out of a home invasion thriller. At a brisk 89 minutes, the filmmaking team created a gift to film enthusiasts everywhere. The NEW 2k scan of the film heightens the dark spaces and highlights the cinematography into a gorgeous transfer that holds up with modern standards. 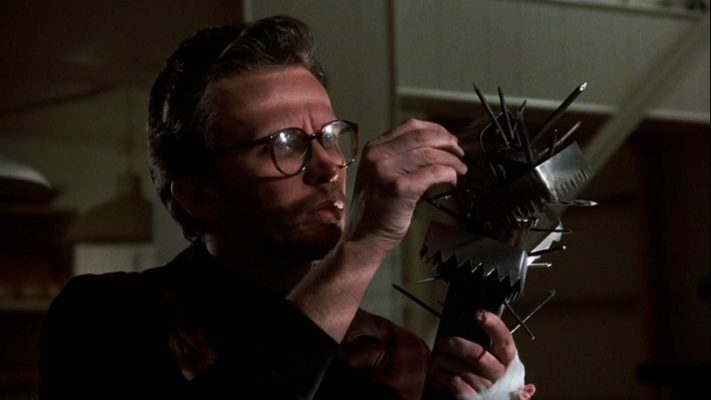 Audio Commentary with Peter Weller and George P. Cosmatos is from the original DVD release, but provides insight and hindsight into the fun of making such a silly and downright creepy film. The best feature on the disc is the interview with screenwriter Brian Taggert who appears to be a pretty brilliant guy with a lot on his mind in terms of displaying the human condition. He recalls stories about working with Weller and the nuances in his own script. The interview with producer Pierre David is fun in its own right, but works as bit of fluff for the disc. Theatrical trailer comes complete with 80s movie trailer voiceover. Its glorious. OF UNKNOWN ORIGIN is to be released by Shout Factory on Tuesday, May 22. Is nostalgia enough for ‘SOLO’ and the future of ‘STAR WARS’?